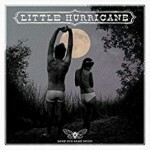 Share the post "Album review: LITTLE HURRICANE – Same Sun Same Moon"
Little Hurricane feature Anthony ‘Tone’ Catalano on guitar and vocals and Celeste ‘CC’ Spina on drums. ‘Same Sun, Same Moon’ is a contemporary take on “dirty blues” (think The White Stripes meets The Black Keys), but the production is much closer to alt-rock and electronic minimalism. They build their music around the twin pillars of emotion and riff driven musicality, with liberal doses of electronica and poetic lyrics. They have described themselves as ‘living room rock’, a term that cleverly evokes feelings of familiarity, homeliness and reliability. But they always carry an ace up their sleeve, such as the unexpected angular guitar line at the end of the opening narrative-led title track, ‘Same Sun Same Moon’, a phrase that pops up again on the stuttering synth landscape and additional muted trumpet of ‘OTL’. The above track showcases both their strengths and weaknesses, as they celebrate ‘real love’, with added harmony vocals over a layered sound, but don’t quite engage us emotionally enough to make a connection with their heartfelt lyrics. Perhaps it’s the fact that Tone Catalano doesn’t always bring enough variety to his vocal attack, a point apparently not lost on the duo, as CC takes a few lead vocal lines to bring welcome contrast. At his best, Tone does have the ability to phrase passionately and nuance people like Jon Butler, Ben Harper and the UK’s Wille Edwards (Wille & The Bandits), and when he’s explored the full extent of his range, his evocative lyrics are further underpinned by intricate rhythms and ever present electronic noodles. The heavy accented guitar and soulful feel on the ensemble resolution of ‘Isn’t It Great’ is far better, and draws us in on the back of an interesting narrative. Then there’s the album highlight ‘Lake Tahoe Eyes’, which is a triumph of subtle dynamics, minimalism, space and time. It’s a song that lets the lyrics breathe, the guitar percolate and benefits from expressive phrasing. ‘Take It Slow’ is another example of their electronic minimalism, while the distorted guitar-led instrumental ‘March Of The Living’ has a big screen vibe and isn’t too far removed from an early career Imperial Crowns style riff, with added echo reverb. The main purpose of ‘March Of The Living’ though, is to bring light and shade to the sequencing and lever us into the Neil Young style sludgy rhythm of another highlight ‘Mt. Señorita’. Tone’s vocal phrasing and diction is much more precise and his snaking guitar line carries the backbone of a song that is punctuated by neat percussive touches and plenty of atmospheric echoes. They get more bluesy on the beautifully judged, sub train-time rhythms of ‘Slingshot’, a drone influenced piece with harmony vocals, electronics and a lyric that again cleverly draws the listener in: “I don’t want no sugar in my coffee it makes me mean”. Little Hurricane might be a little late to the party in terms of the post garage, alt-rock meets dirt blues syndrome, but they make music that demands focus and concentration, as it reveals more with each play. Above all, they have some interesting songs with lyrics that trigger our imagination to suggest fertile filmic landscapes that the band invite the listener to imagine themselves. Hailing from San Diego they tap into that particular atmospheric SoCal musical landscape, while their echoing tremolo sound is sometimes reminiscent of the twisted Americana of Blanche. This entry was posted in ALBUM REVIEWS, ALBUM REVIEWS (Mobile), All Posts and tagged album, alt rock, Americana, Antnony Tone Catalano, Ben Harper, Blanche, Celeste CC Spina, dirt blues, electronica, Imperial Crowns, Jon Butler, Little Hurricane, minimalist, Neil Young, review, rock, Same Sun Same Moon, The Black Keys, The White Stripes, wille and the bandits, Wille Edwards. Bookmark the permalink.